Getting a driver's license used to mean freedom, adulthood, and the open road, but it now seems more like a nuisance. Congestion costs each American $1,348 per year and 97 hours stuck in traffic, according to a 2018 analysis by Inrix, and that can fray nerves. Getting behind the wheel can bring fear, dread, or anger from other drivers' aggressive behavior — and maybe draw out some aggressive behavior of your own. Protecting yourself on the road involves learning how to avoid potentially dangerous situations and understand your own triggers for aggressive driving. Maybe none of that seems so terrible, but there are several reasons to identify and prevent road rage. Leave road rage behind and you can save money by avoiding increases in car insurance premiums, moving violations, court fees, and even legal costs. If you are found guilty of road rage or aggressive driving, your insurance company may refuse to cover you, and leave you responsible for all the costs of an accident. Reducing the physiological arousal associated with driving can improve your physical health. As you become better at maintaining your cool, you lower your cortisol and adrenaline levels, reducing the risks of hypertension and heart disease. You'll be better off mentally and emotionally if you can overcome patterns of aggressive behavior and develop better coping strategies. The average road rage offender has had 27 episodes of raging. By breaking this pattern, you avoid endangering yourself and others and show you can make other important changes in your life. Avoid legal jeopardy. While most aggressive driving is considered a moving violation, in some states road rage is a criminal violation that can result in prosecution, loss of driving privileges, and jail time. Other states may charge road ragers with assault and battery or vehicular manslaughter if fatalities occur. Chances are good that others are deeply disturbed by your driving habits. Avoid terrifying those who love you and endangering them with reckless actions. Remember that your children and younger siblings are watching and learning from you. Offer them a good example to follow. You might also save your own life. Few people pull out of their driveway thinking that this is their final day, but driving aggressively raises the probability it will be. "Road rage," describing a particularly malignant form of aggressive driving, was first used on local television in Los Angeles after a rash of nearly 70 shootings on roads and highways over 10 weeks in 1987. Five people were killed and another 11 were injured. Road rage includes behaviors such as ramming another motorist's car, forcing a vehicle off the road, leaving your car to confront another driver, and brandishing or using a firearm. In the AAA study, almost 4 percent of survey respondents admitted that they had gotten out of their vehicles to confront another driver and almost 3 percent had deliberately bumped or rammed another vehicle. These percentages seem small until they are applied to the general driving population — that's about 5.7 million drivers bumping or ramming, and another 7.6 million drivers getting out of their car to challenge another driver. Two percent of drivers admit to trying to force a vehicle off the road. The causes of aggressive driving include psychological issues, biological factors, demographic considerations, and sociological trends. Road rage may be a symptom of Intermittent Explosive Disorder, a diagnosis that describes a pattern of intense and disproportionate anger damaging to interpersonal relationships and occupational functioning. People with IED tend to have low thresholds for frustration, poor impulse control, and a tendency to externalize blame. Aggressive behaviors are also associated with traumatic helplessness. Some individuals with post-traumatic stress disorders may experience exaggerated fight-or-flight responses to a perceived threat or encroachment by other drivers, or they may have claustrophobic reactions to becoming trapped in traffic that result in lashing out. Aggressive driving is often a response to situational stress. You are more likely to act aggressively behind the wheel when feeling pressured by time, interpersonal conflicts, or anxiety about work. Biological factors include hormonal differences associated with gender, the effects of fatigue and sleep deprivation, and the use of alcohol and other intoxicants that affect impulse control and judgement. In the AAA study on aggressive driving behavior, men engaged in the bad behaviors of aggressive driving significantly more than women in every way except yelling at other drivers — which they still did a bit more. The male hormone testosterone is associated with greater potential for aggression. Fatigue and sleep deprivation can also increase emotional reactivity and impair judgement. According to the National Highway traffic Safety Administration (NHTSA), sleep factors account for 7 percent of all car accidents. While the overall incidence of fatal car accidents corresponds to peak traffic periods — generally between 4 and 6 p.m. — fatalities involving road rage and aggressive driving peak at 10 p.m., when drivers are likely to be the most fatigued. The higher rates of fatalities due to aggressive driving and road rage also occurred on Sundays and Mondays, the days most associated with altered sleep schedules and transitions in daily routines. Aggressive driving may also be a response to substance abuse. Alcohol impairs judgment and often increases irritability and potential for aggression. Other substances that affect mood and judgement include stimulants such as caffeine, nicotine, cocaine, and amphetamine, as well as anti-anxiety medications. Driving risks vary by age. Younger drivers are perceived as riskier drivers due to their inexperience and inattention, often caused by texting and or other uses of a phone, but older drivers have more vision impairments and slower reaction times, and they take more medications that can affect driving. According to data from NHTSA and the Auto Insurance Center: Generation Z drivers — those between the ages of 19 and 24 — reported the most bumping, ramming, or blocking of other motorists from changing lanes, and they accounted for more than 14 percent of fatal accidents that involved road rage and aggressive driving. Millennials or Gen Y'ers behind the wheel — that is, those between the ages of 25 and 39 — had the highest reported rates of tailgating, gesturing, yelling, and leaving their car to confront other drivers, and this age group accounted for more than 54 percent of fatal accidents related to road rage and aggressive driving. Generation X drivers, or those between 40 and 54, was responsible for 21.4 percent of fatal accidents related to aggressive driving. Baby boomers (ages 55 to 75) had a fatal accident rate due to aggressive driving of more than 8 percent. The lowest level of fatal accidents due to road rage and aggressive driving was for drivers over 75 years of age. Road rage may be related to a territorial attitude. Drivers may perceive their car to be an extension of themselves on the road and react strongly to perceived slights or transgressions. 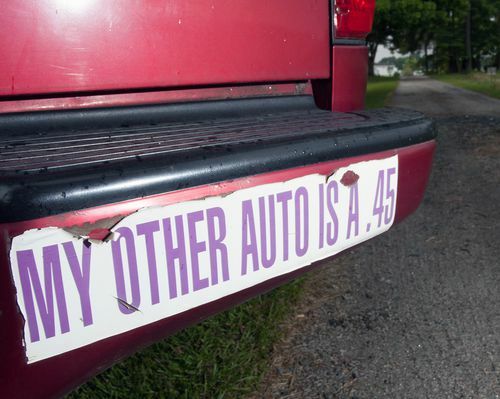 Two studies found higher levels of aggressive driving behaviors correlated with the number of bumper stickers on the driver's cars. The presence of a gun also appears associated with a higher potential for aggressive driving and road rage. Thirty-seven percent of road rage incidents involve firearms. Two studies by the Harvard Injury Control Research Center found that people who carried weapons while driving self-reported higher rates of aggressive driving (tailgating, obscene gestures, shouting) than drivers with no firearms in the car. Other research suggests that rates of road rage involving firearms are increasing rapidly, with states that have the least restrictive gun laws, such as Florida and Texas, having the highest number of incidents. Research is also exploring the relationship between road rage and other forms of aggression. One 2017 study suggested that more time spent in traffic increased the incidence of domestic violence. Like domestic violence, road rage may be a learned behavior. If you have parents or older siblings who modeled aggressive behavior behind the wheel, it may normalize angry actions and foster hostile attitudes toward other motorists. As a driver, you can protect yourself and your passengers by minimizing confrontation and avoiding becoming provoked. While you don't have control over the other driver's attitude or behavior, you do have a choice about your own. Try being attentive, communicative, and generous. Keep your attention on the road and surroundings, minimizing distractions, avoiding texting, and knowing where you are going. Signal your intentions with turn lights or hand signs, making brief eye contact with other motorists and pedestrians, and thanking other drivers with a wave when they are courteous. Remember that driving is not a competition, and give other drivers the benefit of the doubt when it comes to inferring their intentions. Try to be amused rather than angered by their antics. Maintaining a neutral facial expression. Changing lanes if they tailgate you. Slowing down and letting them pass you. Driving to a police station or public place if they seem intent on following you. Memorizing or recording identifying information about the car in case further action is needed. Calling 911 if you feel you are in imminent danger. Don't get angry while driving. Protect yourself from potentially harmful consequences of these feelings that can include health issues, significant financial and legal penalties, injury, and death. Be rested when driving; it affects mood, focus, and impulse control. Before starting your car, assess your emotional state, energy level, and attention span. If you are too wound up, take a short walk or work out before driving. Identify the most stressful points in a drive and prepare strategies to handle them, such as deep breathing. Try keeping calm while driving, especially in traffic, with soothing scents, comfortable seats, and relaxing music or natural sounds. Stuck in traffic? Think happy thoughts. Use commuting time as a transition from work to home, a time to learn a new language or listen to an audiobook, or a chance to think and plan. Leave enough time for unexpected problems on the road. Try to arrive early and use the extra time to prepare for the day, making a phone call to catch up with a loved one or enjoying a leisurely cup of coffee. Know your pet peeves and work to overcome them. If you know you hate it when drivers merge aggressively into your lane, see how it feels when you choose to let someone in front of you. The sense of having a choice may actually reduce your resentment. Be honest about your own driving. Acknowledge that you have made mistakes, been inconsiderate or inattentive, or acted selfishly at times. It might enable you to make allowances for the flaws of others. If you are still unable to manage your aggressive impulses behind the wheel, consider using public transportation or ride-sharing options such as Uber or Lyft.